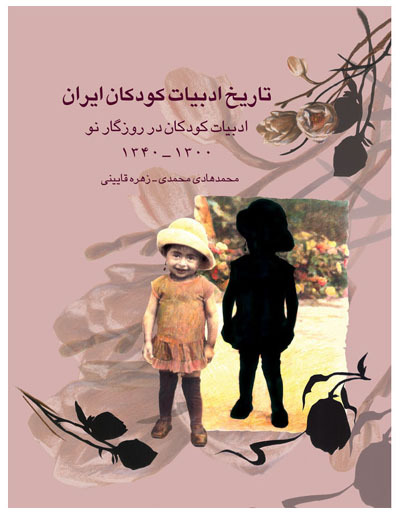 The 5th volume of History of Iranian Children's Literature has been published by Foundation for Research on the History of Children's Literature in Iran (HCLI : www.chlhistory.org). In a constantly changing society which children and young adults are thirsty for learning new things, paying attention to their cultural necessities is crucial. Good children's culture derives principally from an appreciation of children's rights and it is based on respect for children as competent members of society. One of the most obvious rights of children is getting familiar with their culture and this would not be possible without stories and legends. These magic resources would encourage children to think productively, look at problems in many different ways and find new perspectives. Iranian legends, parables, tales, songs, lullabies and riddles originate with the ancient culture. 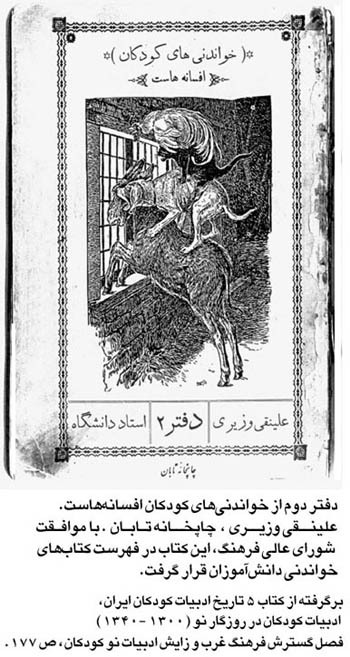 Folk Children's Literature has been gathered comprehensively by great men such as: Sadiq Hedayat, Koohi Kermani, Anjavi Shirazi and others, but the lack of public awareness make them long forgotten titles. Generally speaking, great need for more creative approaches to capture readers is completely obvious and also it is trivial that the future world would be the world of peace, understanding and happiness. So, the responsibility of each educational, cultural, or research centre is just try to bring it closer by planting the seeds of hope in the hearts of children. This can not be possible unless with renewed enthusiasm for working on Children's Literature. In order to do this, Foundation for Research on the History of Children's Literature in Iran (HCLI) welcomes any encouragement, support and advice from anyone who fascinated by the world of children's Literature both in Iran and abroad. The development of modern children's literature (1300-1340) (1920-1960) is reviewed in this volume. HCLI analyzes educational ideas and the literature of modern period as well as socio-economic and cultural situations in the 5th volume in light of existing historical documents. In this period such new factors enter the scene: new educational concepts, continuity of oral literature and folklore, development of a more simple Persian prose, the advent of translations from the West, establishment of new schools, the study of child psychology, and the rise of pioneer personalities as early publishers of books for children. 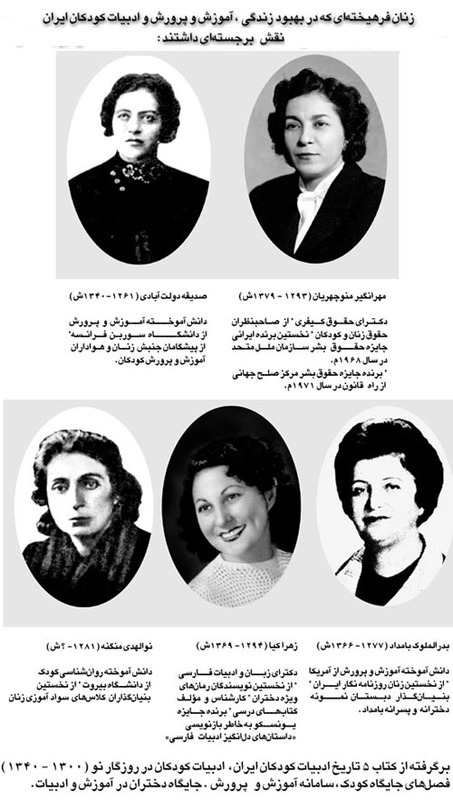 Also, the contributions of pioneers such as Sedighe DolatAbadi, Ali Asghar Hekmat, Jabbar Baghcheban, Eisa Sedigh, Zabih Behrooz, MohammadAli Dai_al_Salaam, MehrAngiz Manoochehrian, Mohammad Bagher Hoshyar, Bersabeh Huspian, Abdolhossein SanatiZadeh Kermani, BadrolMolook Bamdad, Fazlollah Sobhi Mohtadi, Mohammad Parvin Gonabadi, Mohammad Ramezani, Zahra Kia, Hossein Koohi Kermani, Touran MirHadi, Masoomeh Sohrab, Yahya Mafi, Mohammad Bahman Beigi, Abdolrahim Jaafari and others are reviewed in this volume. 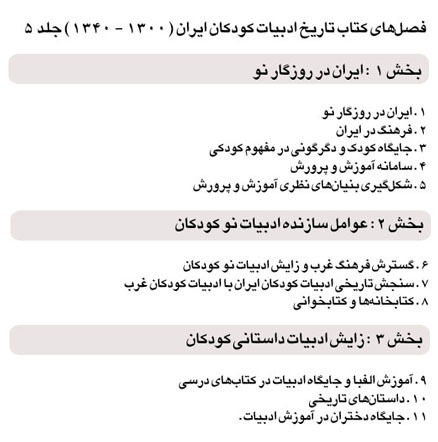 By Mohammad H. Mohammadi & Zohreh Ghaeni. Tehran: The Foundation for Research on the History of Children's Literature in Iran, and Cheesta Publishing Co, 2001, pp 427, ill. 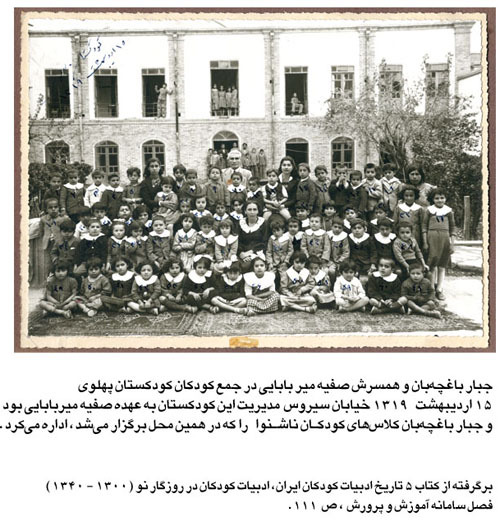 The history of children's literature is an extensive research project based on the historical status of children in Iranian society, prevailing educational views and the growth of children's literature. Children's literature in Iran is a thin branch of the immense and aged tree of Iranian arts and culture. Nevertheless, by researching this thin branch, a whole new field has stretched before us. We have chosen a comprehensive method for this research, which reaches back to 3000 years ago. The project begins with the oral tradition, focusing on ancient times, when literature was narrated for children generation by generation. In 1996, when we started this project, we weren't aware of its extent and thought we could finish the history in one or two volumes. It didn't take a long time, however, to realize we were wrong. After studying documents, we reached the conclusion that Iran has one of the richest treasuries of children's literature in the world. We began by posing many questions, including: what kinds of texts are considered children's literatures? How far can we go back in accessing the earliest documents? What is the relationship between oral children's literature and formal texts? And, how could children's literature be coordinated in relation to historical eras? To answer these questions we have chosen the method of analyzing ideas from the general to the specific. This method helps us see every specific text in relation to the general context. In the first chapters of every volume, general, historical and cultural aspects of each period are analyzed. Then, we have surveyed the status of Iranian children and evaluated educational attitudes. For example, it was much easier to understand the emergence of courtesy literature written for princes when we learned about the educational philosophy of that period. After surveying general societal aspects, we have addressed children's literature specifically. We have tried to determine the genre of every single document in addition its historical status. The most difficult and complicated process in this project was recognizing, finding and accessing books and documents. The old documents and texts related to children's literature were much dispersed and because this research is the first in this field, there is no comprehensive bibliography of children's books. We had to look over all bibliographies, biographies, and newspapers and magazines, which were published during a specific era to find and prepare a list of children's books from that time. In finding every unique document, we have searched many secondhand bookstores in Tehran and other cities in addition to all public and private libraries. We have started this research with the oral tradition, because it is not allocated to a specific time and it links ancient times to the contemporary era. In this research it was rather impossible to include the oral literature of all ethnic groups. We found that the children's oral literature was a rich treasure preserved by each of the dozens of the Iran's ethnic groups. Even this small sample expresses the variety and the extent of children's oral literature. The diversity of Iranian culture is so outstanding that we could survey only a small part of it. Because Iran is an ancient land with diverse and dispersed ethnic groups, we have extended our research beyond children's written literature in Farsi. In our research we include Armenian, Assyrian, Azari, Kurdish and Zoroastrian children's literature. We have included different margin notes in relation with the main text such as: "interview with history", "literary and historical surveys", "selected texts" and tables and charts. These additions help familiarize the reader with historical phenomena by offering different perspectives. For example, in addition to helping the reader comprehend the given analysis, "selected texts" allow them to access rare old documents; "Interview with history" where people who were involved with children's literature, speak about their experience, allows the reader the opportunity to consider views other than the main writer's. 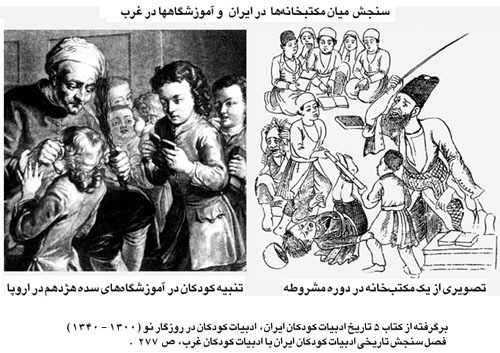 The history of children's literature is not a historical report of the development of children's literature in Iran. It is an analytical study that not only surveys the changes in children's status during the time, but also shows the evolution of the educational system that helped children's literature emerge.